Carpets in every facility are bound to experience spills, but food and drink stains in carpeted areas of cafeterias, offices, restaurants, and other food service areas can be especially hard to remove. The first line of defense against stains is to treat food and drink spots quickly, so they are less likely to dry and become permanent. Sometimes that isn’t possible, however, and Whittaker’s line of CRYSTAL® Chemistry can help remove recent spots and the most set-in stains. For coffee, juice, and other red food dye stains, our CRYSTAL RED STAIN® Plus spotting agent is here to save the day. This neutral pH solution has a simple one-step application, and heat can be added to maximize efficacy on particularly stubborn stains. For wine stains, turn to the CRYSTAL® ODOR & PROTEIN concentrate. This specially formulated solution eliminates odor-causing contaminants with enzymes, adeptly handling wine, fruit, and vomit spots and stains. It is also WoolSafe approved. Many spot removal solutions can leave sticky residues in the carpet that encourage re-soiling. Using our CRI, Green Seal, and WoolSafe-approved CRYSTAL SPOTTER® as the last step in the stain removal process prevents this problem, as any remaining soils are encapsulated and vacuumed away. The CRYSTAL® OIL & GREASE spotting agent is a safe, easy to use solution for oil-based stains that contains no VOCs. We developed this product to effectively remove grease, oil, and even paint from carpet. 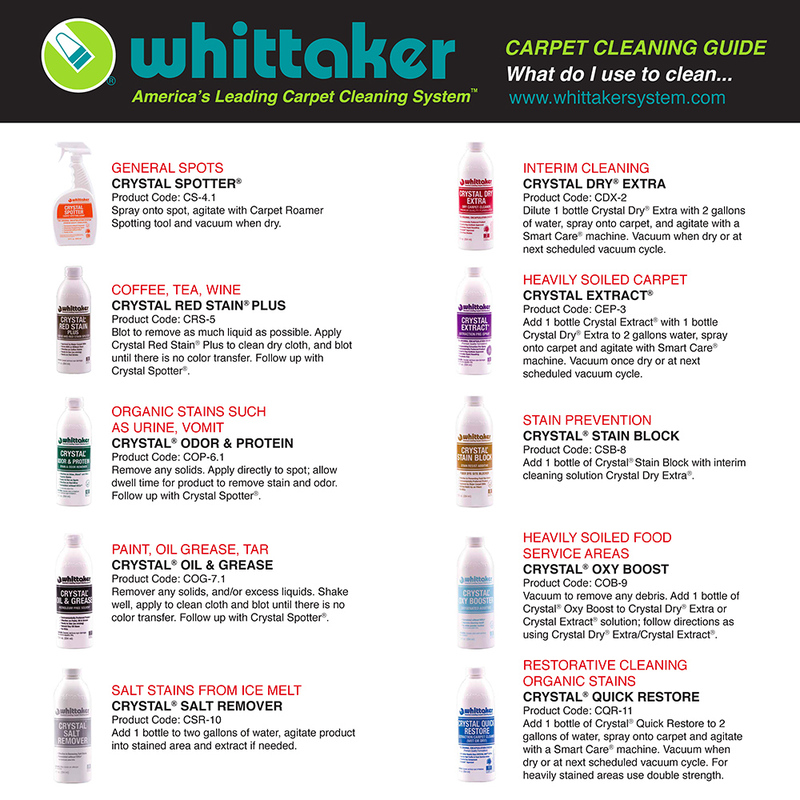 Follow up the stain removal with our CRYSTAL SPOTTER® and keep carpets looking clean longer. If you clean any area that is often troubled by food and drink stains, consider treating the carpet with CRYSTAL® STAIN BLOCK stain resist additive. Add it to CRYSTAL DRY® when performing interim encapsulation cleaning and protect carpet fibers from coffee, wine, juice, and other food dyes. Read about all of our CRYSTAL® Chemistry solutions here, and feel free to give us a call at 800.422.7686 if you have any questions.